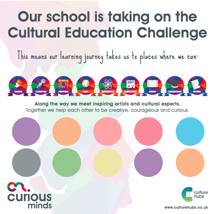 You will also have the opportunity to find out more about the Local Cultural Education Partnerships and receive your own FREE Cultural Education Challenge Plaque for you to display in your school. This will help you recognise and celebrate meaningful partnerships with arts and cultural organisations, as well as acknowledging schools’ involvement in schemes such as Artsmark, Arts Award, and SLiCE®. There will also be an Awards Ceremony taking place to celebrate schools that have already achieved their Artsmark level status and Lunch and Refreshments will be served during the day.